This pencil drawing was sold by Christie's in Paris on 23 June 2009 as a "portrait of a young man" by Dominique- Vivant Denon. "This sketch of Maximilien Robespierre was made in the prison of La Force...by Louis David...Louis David gave this sketch to the Duchesse de Tourzel..."
The subject is clearly Robespierre but the ascription to David is false; comparison with other sketches by Denon, notably the "Revolutionary heads" in the Met., make it clear that he is the artist. It is still an interesting picture. We have no means of knowing if it is drawn from life; but Denon had at at least seen Robespierre and was acquainted with contemporary portraits. 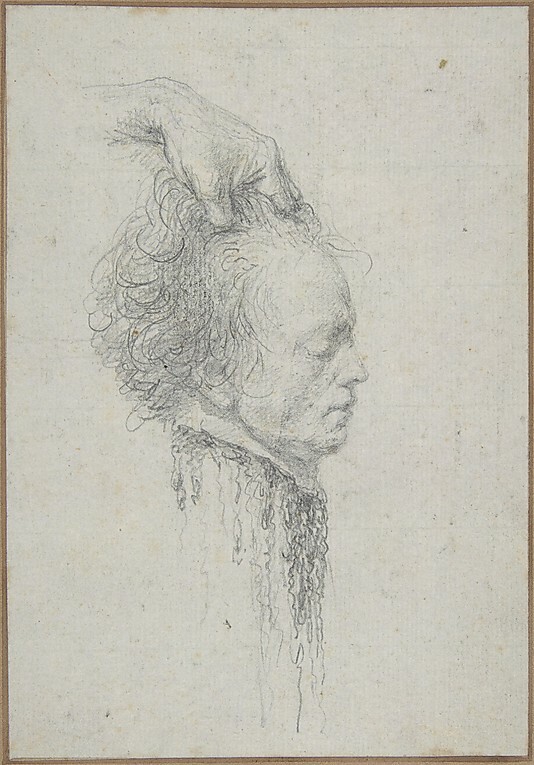 Among the Metropolitan Museum sketches is this picture of the guillotined head of Robespierre, which is probably just a work of imagination - it similar in composition to a well-know print of Louis XVI. I now wonder whether another work by Vivant Denon might be not be the Robespierre from the Morgan Library - see post of 9th July 2013; the slight caricature fits with his style. Apparently, Xavier Salmon, in the catalogue of the 2008 Marie-Antoinette exhibition at the Grand-Palais, suggested that David's famous sketch of Marie-Antoinette on her way to the guillotine, might in fact be by Vivant Denon.. Denon was certainly in Paris at the time. It is a hard conclusion to swallow given the amount of emotional weight this picture carries as drawn from life by the great David. But I have a feeling he may be right! 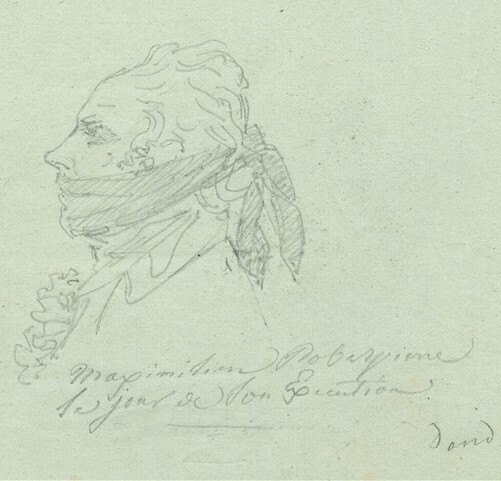 I must say that none of the alleged Denon 'Robespierre' drawings actually looks like him… although the severed head looks like the alleged death-mask. I wonder if they are intended to be another subject (whether revolutionary or royalist) and have simply been misidentified at some point? The young man in the sketch sold in 2009 is too pudgy. If it's a Robespierre, I wonder if it's Augustin, who had a chubbier face?